Make your own Lovestory! 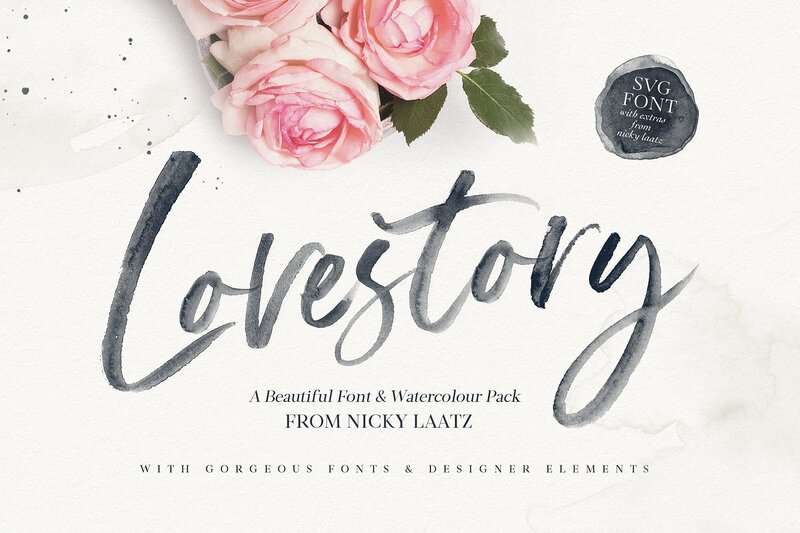 , with the new Lovestory SVG Font Collection – a set of elegantly co-ordinated graphic SVG fonts and elements to create beautiful typographical designs. A layered Photoshop File with all the original letters used to make the SVG font. All the original watercolour letters as Individual transparent PNG files. Solid versions of the SVG font – as a TTF( Truetype) Regular font, which works in all basic software able to type with standard fonts. Lovestory SVG font does not contain language support , however accented characters, but you will find individual accents, should you require them in the Photoshop file. The Solid TTF fonts do support the following languages : Danish, English, French, German, German (Switzerland), Norwegian Bokmål, Portuguese, Spanish, Swedish, Swiss German.